What’s going on with APC-200A transmitters? When we are playing with arduino, it’s very interesting to add wireless comunications for a wide variety of appliactions such us R/C, WSN or Home Automation. For me RF it’s a very charming field, maybe because I’m amateur radio since long time. So I love to play with arduino connected to radio data transceivers. As result back at home I was able to draw data over a map and the limit distance in that conditions were about 650 mt. 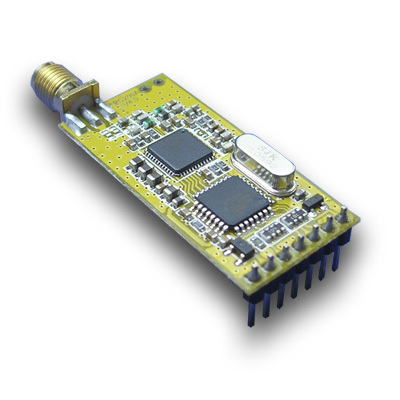 BUT….. the usual problem of this RF modules is not the coverage but the difficult to get the configuration running. Maybe you reach this blog looking for a solution to that problem. Let’s talk about that configuration program. The program is RF-Magic V4.2, quite easy to use, but normally the problem is achieve the communication between module and PC. The problem I found when I was trying to proceed was… There’s no way to link with the program if you’re using a USB FTDI Converter! So, the following steps shows how to get a positive result linking program and modules. Use a RS-232 to TTL converter (MAX-232). Connect the Serial converter and the RF module to the available port. Some people said that the converter has to be connected first and the RF module must be powered after software is running. I tried to do it at the same time and there’s no problem, maybe because I’m using parasitic power supply from COM port. Read, Write, and perform all changes you want! – BM options, Latency timer to 2ms. Also other values probably work, I only tried these and it was all good! Thanks for sharing your issues.